OAXACA CITY, MEXICO - Locals, residents and visitors are invited to share photos of trees in Oaxaca the first week of April 2008. The innovative Flickrmeet takes place April 1-5 in Oaxaca City with optional visits to nearby villages in the Central Valleys and Sierra Juárez. The event is free and is a testament to the values of slow travel. See the schedule below. April is Forest Month on Planeta.com. The award-winning website will be updating features on trees, conservation and forestry. Special attention will be paid to community efforts to protect forest biodiversity and to develop tourism initiatives. Keep it simple! Take photos of Oaxaca trees and upload them to the Flickr group Árboles de Oaxaca. Flickrmeets provide an opportunity for members of Flickr to get together. Activities are confirmed the week of the event. For details, consult the poster and keep an eye on the Oaxaca Wikispace. The 2008 Oaxaca Flickrmeet is an informal event to documents the environmental and cultural diversity of Oaxaca. There will be great food (!) and opportunities to learn more about the Web to develop environmental awareness. Those who cannot be here in person are invited to share photos of trees in the World Trees Group. Tuesday, April 1 -- Find the ahuehuete tree at old train station featured in the Curtiduria map by Francisco Verástegui. (Map available at Amate Books), Macedonio Alcalá #307. Meeting point: old train station, 11am. Wednesday, April 2 - Ahuehuete tree count in Santa Maria del Tule (includes visits to Ayuuk and Caldo de Piedra). Meeting point: Ayuuk, 11am. Friday, April 4 - Buscando a Tito (Finding Tito!) Look for the pine needle baskets at the Pochote Market. Video. Meeting point: Pochote Market, 11am. What trees are blooming in April? What trees are originally from Australia? What trees were planted by notable Mexican leaders? Where can you buy fair trade coffee in Oaxaca City? Where can you visit community forestry initiatives? What is the legacy of Gregorio Chávez? Oaxaca's Flickrmeet is a spin-off of the 2008 Rural Tourism Fair. The event's most viewed YouTube video showed travelers walking around the town of Santa María del Tule in search of ahuehuetes. This video has been seen more than 2,000 times. 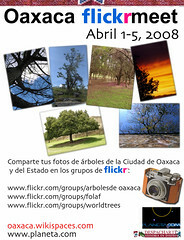 Árboles de Oaxaca was created in 2007 and as of March 2008 has 36 members and 103 photos. The group was created to document the historic and notable trees featured in the map created by Francisco Verástegui and other trees in the state of Oaxaca. 1) Improve awareness of forestry issues by publishing original materials and by updating resource guides with links to recommended resources elsewhere on the Web. 2) Improve awareness of the synergies between forestry and tourism. Ecotourism is a 'non-timber product' that can be a complementary asset to forestry. EVERYONE - Pick up your free map of historic and notable trees of Oaxaca City at Amate Books, Macedonio Alcalá #307. VISITORS - Check out places to stay ... and eat! Would you like to know more about eco travels in Oaxaca? Register for the Oaxaca Options Bulletin.